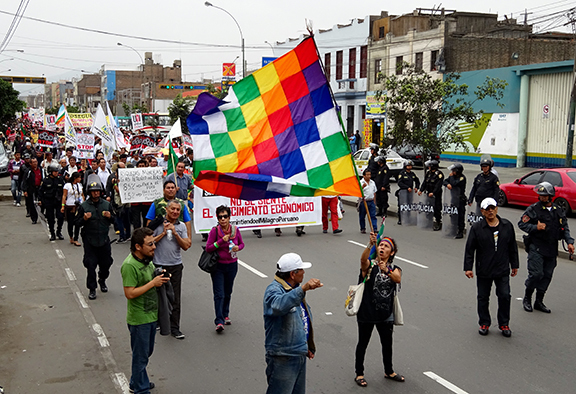 5,000 people marched in Lima to reject extractive politics during the IMF and World Bank’s annual governor’s meeting in November 2015. This Webinar took place on Thursday, September 15, 2016 at 12 p.m. EST. Research shows that nonviolent means of waging a conflict are not only morally but strategically more effective than violence. Still, not much is known about when movements respond to violent repression with violence or when they will choose nonviolent resistance instead. This webinar presentation will shed light on some of the reasons why groups might transform their tactics from impromptu riots and violent responses to disciplined and strictly nonviolent means of struggle. 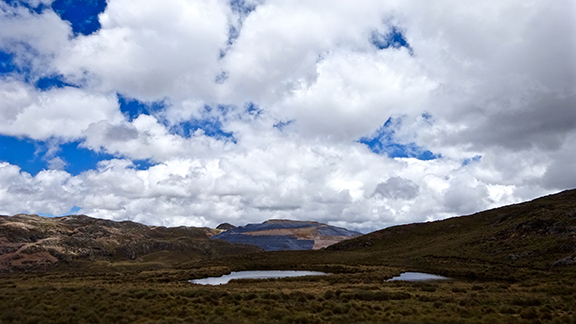 Ethnographic evidence from four cases of gold mining conflicts in Peru will help us illustrate how, in response to an adversary’s discourse that branded resisters as criminals and terrorists, activists planned, strategized and trained in self-restraint, adopted nonviolent frames and tactics, and disciplined their public actions. Michael S. Wilson Becerril is a Mexico City native and a Ph.D. candidate at the University of California, Santa Cruz, where he focuses on peace and conflict in Latin America. He is also a Research Fellow at the Council on Hemispheric Affairs and a Ph.D. Fellow with the International Center on Nonviolent Conflict. As an undergraduate, Wilson was a co-host of a news radio show, Student Body President, and News Editor of the campus newspaper. 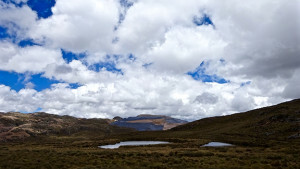 He is currently living in Peru and conducting fieldwork for his dissertation. His research centers on extractive industry behavior, political violence, civil resistance, and the politics of media. His work has been published in Peace Review: A Journal of Social Justice, COHA’s Washington Report on the Hemisphere, the North American Congress on Latin America’s Report on the Americas, Waging Nonviolence, Human Rights Review, AlterNet, Tikkun, Counterpunch, and others. He can be followed on Twitter: @guidolions. Boykoff, Jules. 2006. “Framing Dissent: Mass-Media Coverage of the Global Justice Movement.” New Political Science 28 (2): 201-228. Dudouet, Veronique. 2009. From War to Politics: Resistance/Liberation Movements in Transition. Berghof Report Nr. 17 (April). Berlin: Berghof Research Center for Constructive Conflict Management. Erickson Nepstad and Lester R. Kurtz. Emerald Group Publishing Limited. Haalboom, Bethany. 2011. “Framed Encounters with Conservation and Mining Development: Indigenous Peoples’ Use of Strategic Framing in Suriname.” Social Movement Studies 10 (4): 387-406. McLeod, Jason. 2015. “From the Mountains and Jungles to the Villages and Streets: Transitions from Violent to Nonviolent Resistance in West Papua.” In Civil Resistance and Conflict Transformation: Transitions from Armed to Nonviolent Struggle, ed. Véronique Dudouet. New York: Routledge. Postill, John. 2014. “Spain’s Indignados and the Mediated Aesthetics of Nonviolence.” In The Political Aesthetics of Global Protest: Beyond the Arab Spring, eds. P. Werbner, K. Spellman-Poots, and M. Webb. Edinburgh: Edinburgh University Press.